In the early days of mSupply, this report was designed to show the stock at the start of the financial year; it is dependant upon having Set the start of year stock, a topic covered in the Special Menu section of the guide. The report produced lists the stock at the start of the year. If you have not used this Set the start of the year stock feature we suggest you consider using the Stock on date report, entering the first day of your financial year as the date, and selecting Stock at start of the day. A report will be produced that lists each stock line that is currently showing stock greater than zero. Should you wish the report to include items/batches with zero stock, the box in the lower left needs to be checked. A “Find” report allows you to enter the normal item find criteria to choose which items to include. A random report allows you to enter a number only. That number of items will be randomly chosen, and stocktake sheets for those items printed. This facilitates spot checking of your actual stock situation. Should you wish the report to be department specific, then that department should be selected from the drop down list of the departments which you have created. 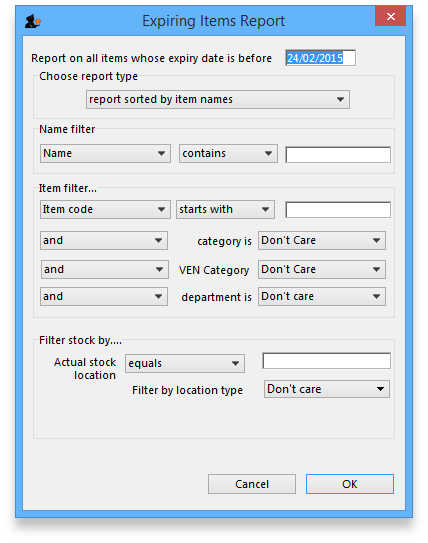 Should you wish the report to give information on a particular location, then that location should be specified , selecting the appropriate operator of the three available in the drop down box alongside the Filter by actual stock location option. “Each batch shown separately” will also give you a column on the right where, having done a physical stocktake, you can enter the quantity that is actually in stock, allowing any corrections to be made in mSupply. “Total stock for each item” will not show individual batches, but the total quantity on hand of each item. List the price of each batch in stock, with a total at the end of the report. mSupply provides the feature of printing the Donor name on the Current Stock report so that organisation donating the goods can be identified and tracked. Enter the date for which you wish to show the stock. Show items only: each item in your system will have a single entry with the total quantity on that date. Show items with batches: each batch, its expiry and batch number along with the quantity of stock will be shown. Show batches with summary: as 2, but every item has an aggregate line before the lines for each batch, showing the total quantity for all batches of the item. So it's a bit like a combination of 1 and 2. The Report on items whose box allows you to restrict the report to certain items only, using item properties or different categories as filters. Check this checkbox to view the report directly in your chosen Spreadsheet program. This report is used to find the total stock value either for a particular department or all departments. The drop down menus allow customisation of your report by entering appropriate search criteria from the many options. 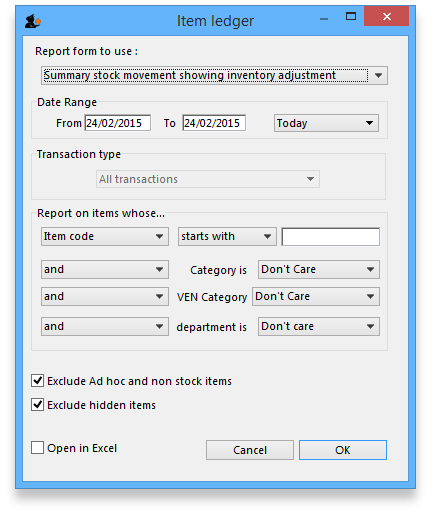 Check this checkbox to directly open the report in Excel rather than printing. 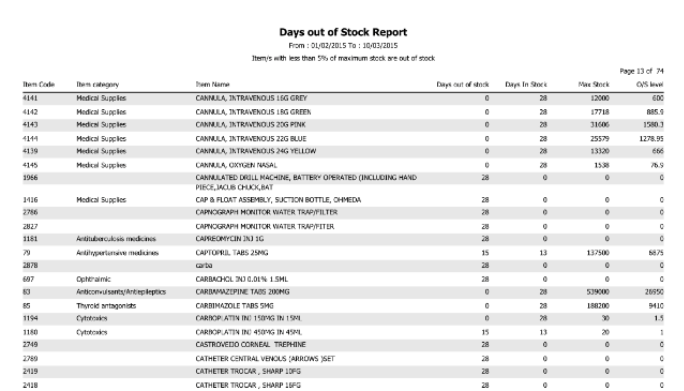 This report shows a graph for an item or items showing the quantity of stock on hand for each day over a defined period. Note that if you have allowed editing of confirm dates on transactions, mSupply's ability to calculate accurately the data used in this report may be affected. Enter the date range, or select the required period from the drop down list, the items on which you wish to report, and appropriate filters, if any. Remember you can use the item flag field to select an ad hoc list of items to include in your report. 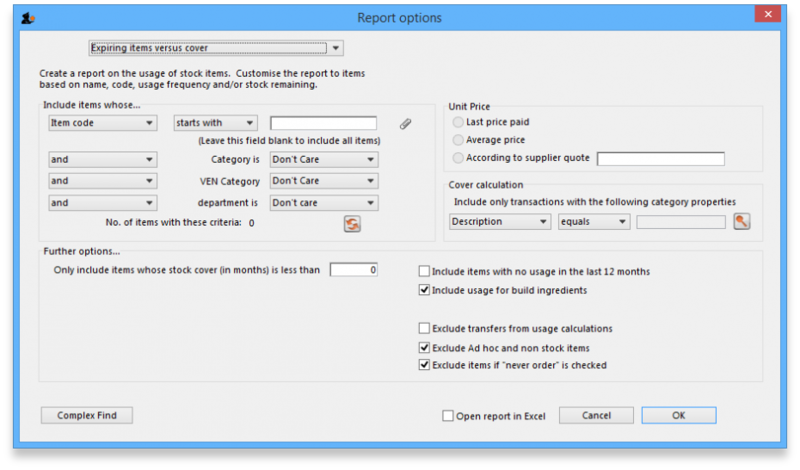 Clicking OK displays a window where you are shown a graph of the quantity in stock on each day for the first item that matched the criteria you entered. This window also displays a list of items that were found. To display the graph for a different item, choose it from the list. This report can be used as one of a set of key indicators for performance of a facility by comparing days out-of-stock of key items from one year to the next. This report allows you to view an on-screen or printed list of items. There is only one report layout listed in the window, but please tell us what you would like, and we'll consider adding it. This option will only show “local data” as an option unless you purchase a web services enabled version of mSupply, in which case you can view reports from remote locations running mSupply. Contact us for more information. Specify your required options from the drop down lists; the desired period may be identified either by entering dates in the From and To fields, or by using the drop down list to the right. Clicking the Complex find button opens the Query Editor, allowing you to enter specific criteria relating to your search. This report gives you a breakdown of item usage for the last few months, with summaries for the last 2 years, It also includes stock on hand and stock on backorder for each item in the report. The report produced is very useful for forecasting or for seeing a list of items that need to be ordered. This menu includes an item usage report, a suggested ordering amount report, or to auto generate a tender from the drop-down list at the top. This form is used for all 7 functions. For now, leave this as it is (Note that the Item usage report with pending purchase order option will show you item usage with details of items currently on order and their expected date of delivery). otherwise enter an item name or code. For example, to report on amoxycillin stocks, you could enter “amox” into the field. Depending on the entry in the first field, further options are available in the following two fields, but these will vary according to the entry in the first field. Among the options, he first field allows you to make your selection from the names given to custom item fields in the Preferences if this feature has been used. If you wish to use shelf locations, then select the shelf location option and specify the desired shelf. You can use the drop-down list to find Items with a particular code, or to use the values you have entered into one of the custom user fields. If this isn't powerful enough, use the complex find button to display the full query editor. If you want only to report on items whose stock is low, enter the threshold for days of stock on hand into the second field. For example, entering 90 into this field will only include items in the report whose stock is not sufficient to cover average usage for the next 90 days. 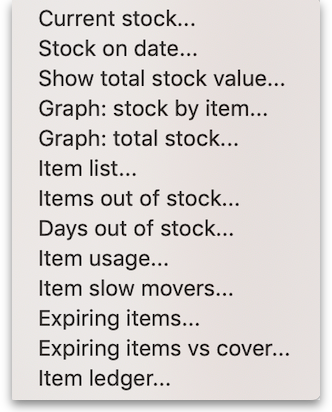 Enter “0” (zero) for this field to report on items with any amount of stock remaining. If this box is checked, items with no usage over the last year will be included. This check box will have no effect if the previous “days cover” field is filled in, as an item with no usage will have “infinite” cover- any stock you do have is going to last you forever! If you manufacture items, you can choose whether the use of ingredient lines in manufacturing is included in the report or not. 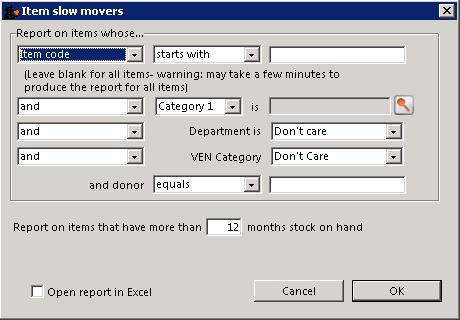 Checking this box opens Excel (or any installed spreadsheet) and displays the report directly. If you want to save the report, choose File > Save as… in your spreadsheet program. When in the Item usage report dialogue box, select the 'Suggested ordering report' option from the drop down box at the top left. Note the extra options for including item usage when calculating item ordering quantities. Also note the option to include ordering for build items. See item builds for more on built items. This report gives analysis per item and the final column provides a suggested quantity to order. It is then the responsiblity of the Purchaser to make the final decision on how much stock to order. The window that appears when you choose this report is the same as the previous one; with exactly the same options available; the report produced differs only in that any lines having outstanding Purchase Orders have the relevant details of the Purchase Order displayed. Enter your search criteria in the top section. 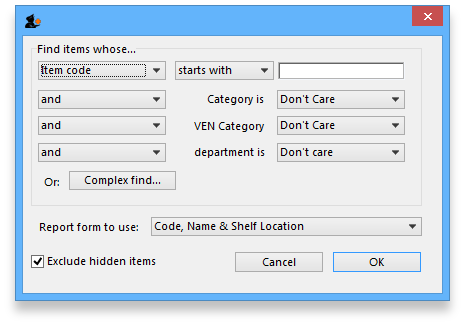 Use the drop down boxes as appropriate to select Category and/or Department if required. Enter the number of months of stock to report on. Items with more than this number of months of stock on hand will be included in the report. The correct figure to enter here depends upon your desired stock turn. In general, if you are turning over your stock 3 or 4 times a year, you would want to know about items which have more than 8 months of stock on hand. The report is calculated using the last 12 months usage as a guide to the average monthly usage. You can check the Open report in Excel box to open the report in Excel, or any installed spreadsheet. The report produced is very useful for managing under-performing inventory. It allows you quickly to obtain a list of items where a reduction in stock is desirable. This report will ask you to enter a date, and will then give a report of all item lines in stock whose expiry date is before the date you have entered. For example, entering 31/8/11 will display all items with expiry dates before 31st August 2011 (Enter the date in short format in the way your computer is set to handle dates (DD/MM/YY or MM/DD/YY or YY/MM/DD). You can additionally filter the stock by the location type or the actual location in the warehouse. This is helpful for reporting on items in certain sections of your warehouse. Three report type options are offered; select as appropriate. You may refine the search by using the Name filter and/or the Item filter..
mSupply provides the feature of printing the Donor name on the Expiring Items report so that the organisation donating the goods can be identified and tracked. This can help with disposing of or returning goods to the Donor. This is a versatile report which allows you to see at a glance the amount of any stock items, and the number of months' cover provided by that amount of stock you have. Note: The cover calculation uses the last 12 months of usage data to calculate your rate of consumption. Many filters may be applied in the drop down lists, which are the same as described under Item usage… above. Note that If the field you are searching is a boolean field, e.g.Essential Drug List, “false” appears as the default entry, which you may change to “true”. This allows the user to include or exclude specific categories to be used in calculating coverage. Clicking the magnifying glass to the right lists categories to be chosen. If you wish mSupply to remember the criteria which you have entered, click on the paperclip icon, and your selections will appear the next time you open the report. Once you have selected your required criteria, click on the Refresh icon to show the number of items which match your criteria, and which will, therefore, feature in the report. Ledger entries may be viewed in this report; different formats of report are available in addition to several filter options from the drop down lists, so the report may be designed to meet your specific requirements.